Tri-Miami Academy shines at FCB Primary! Lesley-Ann Nelson, "Ronnie Nelson Jnr. Under-10 National Chess Champ and Tunapuna Boys R.C shines at the F.C.B. 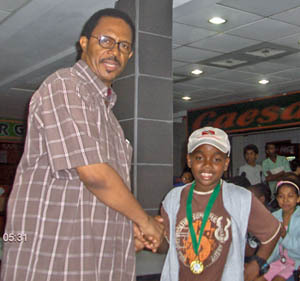 Primary School Chess Championship," 2 November 2006 (Port-of-Spain, Trinidad). On Sunday 29th October concluded the nine rounds of the FCB Primary School Chess Championship where which took place at Valpark Shopping Mall, Valsayn. Ronnie Nelson Jnr. a student of the Arima Boys' R.C. and a member of the Tri-Miami International Chess Academy cup the 1st place on board 2 with a 6½ points, losing one on time. However his team secured 2nd place. He is soon to travel to Miami to participate at the Miami International Chess Championship from 26th -29th December 2006, and then the Junior Orange Bowl International Scholastic Chess Tournament, in Miami. He will be chaperoned by his aunt Mureen Nelson who recently accompanied him to El Salvador. RJ Nelson wearing his medal after winning the 1st place for board #2. Andrew Bowles of the T&T Chess Academy congratulates him. The students of Tunapuna Boys' R.C., known as the "Rising Chess Stars," although not the favourite, battled their way into 3rd place. Kevin Mahabir performed well, securing 6 wins, just ½ pts from securing first place on board 1 which was won by Justin Edwards of Blackmans' Private school. Also scoring for the Tunapuna Boys' team were Akeenie Murray with 5 points, Stephan Pierre and Keno Samuel both with 4 points. All members are of Tri-Miami International Chess Academy. The results of the tournament: Christian Academy -1st place, Arima Boys' R.C "A" team -2nd place, Tunapuna Boys' R.C. -3rd place, Blackman's Private School -4th place.